ROME—Italy’s new government wants to reject a painstakingly negotiated trade deal between the European Union and Canada, and that is welcome news to Ettore Prandini, a small farmer in Italy’s fertile north. Mr. Prandini, who sells milk to producers of the famed Grana Padano cheese, says his revenue is set to fall by a fifth this year compared with last. He blames the Comprehensive Economic and Trade Agreement, or CETA, which late last year eliminated tariffs between the EU and Canada on many products. 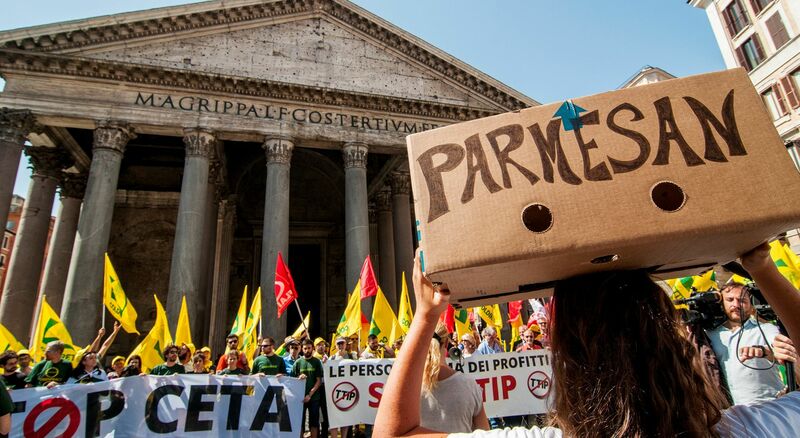 Such complaints from small farmers have prompted Italy’s new government, a coalition of the antiestablishment 5 Star Movement and the nativist League, to say it will vote down CETA in Parliament, although it has set no date for doing so. The agreement came into provisional and partial effect in September last year. To make the trade deal permanent and fully effective, all EU member states must ratify it. If one EU country rejects it, the whole deal is annulled. CETA continues to be in effect for now, but the threat looms that Italy’s dominant populist parties could shoot it down. The failure of the accord would deal a heavy blow to the EU’s hopes of strengthening rules-based global trade by reaching similar agreements with other partners. An Italian veto would also highlight the EU’s growing challenge of maintaining common policies amid the rise of upstart, antiestablishment parties that derive much of their popularity from their willingness to defy EU authorities. No EU country to date has derailed a trade accord after its approval by member governments and the European Parliament. If Italy doesn’t ratify CETA, it would have to further notify the EU to begin the process of terminating the accord, which would remain provisionally in place in the meantime. The 5 Star Movement and League have long expressed skepticism toward free trade, globalization, multilateralism and the EU, though neither party is pushing for Italy to leave the bloc. The two parties have vowed to protect small Italian producers such as Mr. Prandini from trade deals they say more likely benefit big corporations. They are also challenging the EU’s attachment to open, competitive markets by pledging greater government intervention to protect Italy’s airline and banking sectors. EU data suggest Italy is already benefiting from CETA. Overall Italian exports to Canada have risen by 2% in the eight months since the trade pact came into provisional effect, compared with the same period a year earlier. Italian exports of food and livestock to Canada have fared even better, growing by 12%. Italy’s main business lobby Confindustria supports the trade agreement and is lobbying the government to help the EU stand up for free trade at a time when the U.S. administration of President Donald Trump has raised tariffs on some imports and is threatening to raise others. But Coldiretti, which represents farmers exporting around €40 million ($46.8 million) worth of goods to Canada out of total Italian exports to Canada of €3.9 billion last year, says there are already signs the trade deal is penalizing its members. Exports to Canada of cherished Italian cheeses Parmigiano-Reggiano and Grana Padano dropped by 10% in value in the first quarter, compared with a year earlier, Coldiretti says. Total Italian cheese and dairy exports to Canada fell 2% over the same period. Mr. Prandini says competition from Canadian Parmesan has led to a 15% price drop for high-quality Grana Padano, which in turn has pushed down the price of milk. —Emre Peker in Brussels contributed to this article.